Impress your family and friends with this colorful salad. This tropical flavored salad is as delicious as it looks. One bite and they won't be able to resist eating more. Allow pineapple to drain well. Pat with paper towels to soak up some of the excess juice. 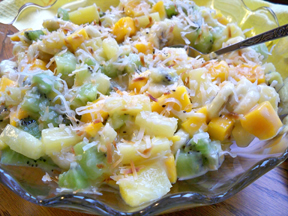 Prepare the mango, kiwi, and bananas; place in a bowl. Toast the coconut. 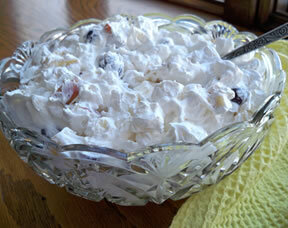 Reserve 1 to 2 tablespoons of the toasted coconut and add the rest to the bowl of fruit. 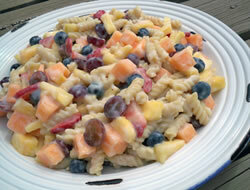 Add the Pina Colada yogurt to the fruit and gently stir until al the fruit is evenly coated. 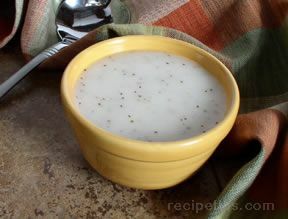 Pour it into your serving bowl and sprinkle it with the reserved coconut. "Good fruit salad. Made it for dinner on Sunday and my kids loved it. Next time I think I will use a little less pineapple and add more bananas because they are the kids' favorite. I had a hard time finding the pina colada yogurt but after searching all the brands I found it in the section of Dannon brand yogurts. It really was the perfect dressing for this salad."